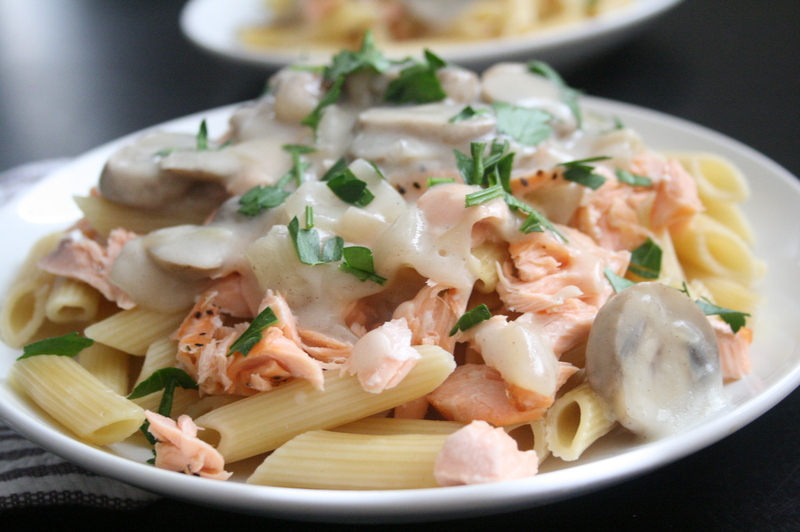 Flaked Salmon with Pasta & Mushroom Sauce - Kosher In The Kitch! Flaked Salmon with Pasta & Mushroom Sauce - Kosher In The Kitch! Place salmon, skin side down on a baking sheet covered with parchment paper. Drizzle olive oil over salmon. Season with 1/2 t salt and montreal steak seasoning. 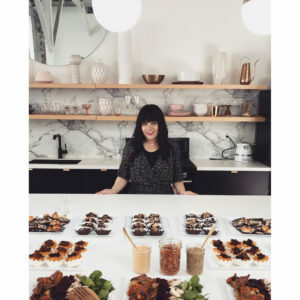 Place in oven on 400′ for 18 to 20 minutes or until salmon is cooked through and flakes easily. While salmon cooks, saute onions and mushrooms until tender, about 10 minutes. Add sherry cooking wine and season with 1/2 t salt and pepper. Mix well. Add the almond milk and mix well. Add the water mixed with corn starch and stir until sauce thickens. Serve over cooked pasta and flaked salmon topped with parsley.